With her striking looks and unique dress sense, Frida Kahlo is not only one of the most influential artists of her generation but also a unique style icon, as seen here in our most loved post of the week on AnOther Loves as chosen by Trevor De Cotta. Influenced by Mexican culture – both its vibrant colours and symbolism – Kahlo frequently referenced it in her work and also her dress, which was considered offbeat and unconventional for the time. During her heyday in the 1930s and 40s the majority of Mexican women preferred less traditional and more modern attire. Having suffered lifelong health problems, which include contracting polio as a child and being involved in a traffic accident as a teen, Kahlo’s work focused on her painful physical and emotional experiences. As a result of the polio, which left one of her legs much thinner than the other, Kahlo would also try to cover them up with long, layered, flowing and traditional silhouettes – which then became her style signature. Going against trends, Kahlo chose to keep her brows thick and unruly unlike the heavily plucked Hollywood-style of the time. A distinct trademark of the artist, Kahlo often exaggerated them in her many paintings (55 out of her 143 paintings ever made were self-portraits). 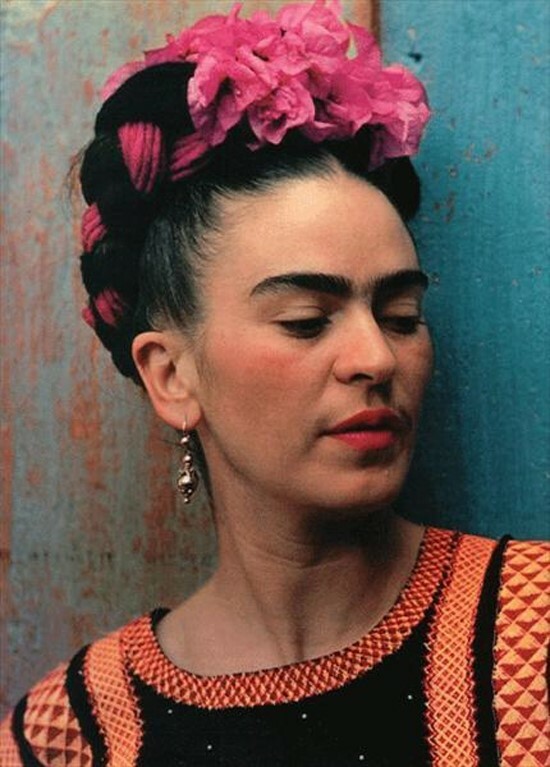 Wearing her long black hair in a way deemed unfashionable, Kahlo would centre-part and braid it into a tight bun and accessorise it with headpieces and flowers usually from her native country. Often wearing flowers and using them in her paintings as a celebration of her national heritage, their symbolism of fertility and fecundity was also pertinent to Kahlo who was unable to have children herself as a result of the accident in her teenage years. Why did you choose to Love Frida’s Flowers and also her quote you included beneath? Spring is now upon us and the colours in the photo are quite amazing. Over the last month I've been doing quite a bit of research into gardens and plants, due to the fact that I want to start designing and landscaping my garden. I stumbled across an article about Frida and flowers, and the quote: “I paint flowers so they will not die”. I like that Frida tried to keep something she found beautiful alive and I found I could relate quite strongly: I hope I can keep that damn garden alive if not I could have invested all that money in a really nice painting. What do you make of Frida Kahlo's unique kind of beauty? Frida's beauty is unique because of the trials and tribulations that she went through. You can sense this in her dark, brooding eyes – they ooze pain and emotion. It's a dark beauty, I like that. And what for you is beautiful in a woman? I appreciated an acid tongue, a dark sense of humour and a devil may care attitude. This is not to be confused with a Devil Wears Prada attitude; I loathe Anne Hathaway. Strong brows, a plaited head of flowers and traditional, flowing Mexican dresses are Frida Kahlo trademarks – do you have any trademarks? The monobrow is a pretty strong look if you can make it work. The only other person I know who has successfully pulled off the same look is Bert of Sesame Street fame. Frida is quite confident in all of her photos, which is what makes her monobrow a defining look, my defining look would be the quite noticeable fact that I am short. I'm yet to work out how to confidently make that work for me yet. Flowers are a strong feature and symbol in Kahlo’s work and look – what are your favourite flowers and why? My favourite flowers are the roses on the cover of the New Order album Power, Corruption and Lies. The Peter Saville artwork is a reproduction of the painting A Basket of Roses by Henri Fantin-Latour. I was probably 16 when I noticed my sister owned the album, I had never heard of New Order nor could I identify any of their songs. I started listening to that album based purely on the cover artwork.